Rule #1: Don't Die Out There. This was a concept Trey had a little difficulty grasping.Even though we're outdoorsy, these city-slickers weren't prepared for the desert that day. Our Virgin America flight from Dallas to Vegas landed shortly after lunch time so we grabbed our rental car from National after much ado. (Reservation issues, two cars wouldn't start, but everyone was super polite which always helps things go smoother.) Our AirBnB wasn't going to be ready until 4, so we headed over to Red Rock Canyon to take in the scenery. We picked up some Gatorade on our way back to our AirBnB and met Hiroko. We relaxed for a couple of hours in her immaculately clean and cooly air conditioned home. After a brief siesta and extensive consumption of Gatorade, we decided to go to dinner at Echo & Rig (after calling to make reservations, of course). 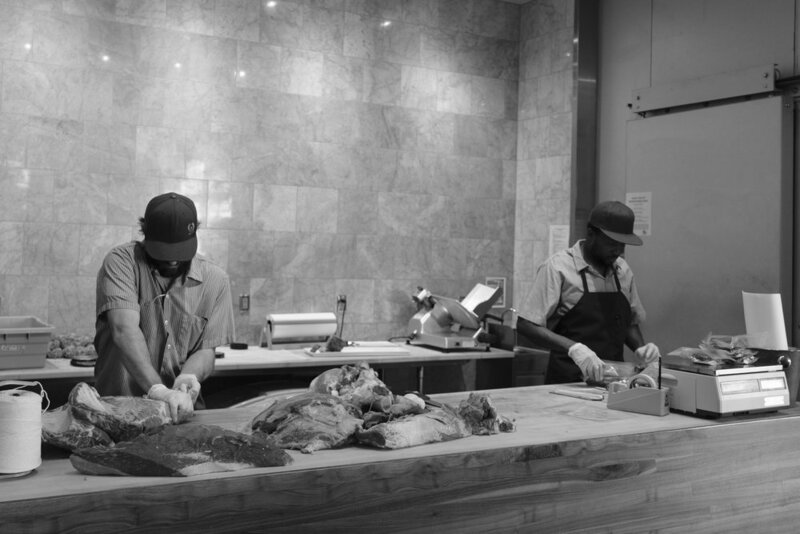 Echo & Rig is a butcher shop that happens to have a full restaurant. I will also say this: the service we received was fantastic, even though we showed up in our dirty hiking clothes. While we waited for our table, I was mesmerized by the butchers who were shaving prosciutto so thin it melts in your mouth. I think the guy was tired of me staring ravenously at this prosciutto and handed me a slice. My mouth wept. Our waiter educated us on cuts of beef and the farming practices of the producing ranches. This was definitely one of the top 5 steaks I've ever eaten; they also have vegetarian and seafood options, if that's more your thing. After dinner we went over to Rolled for some ice cream, the line was out the door... So we called it an early evening and just drove back to our AirBnB.